Today I'll be featuring the earlier version of the new New Fantastic Four that I posted yesterday. 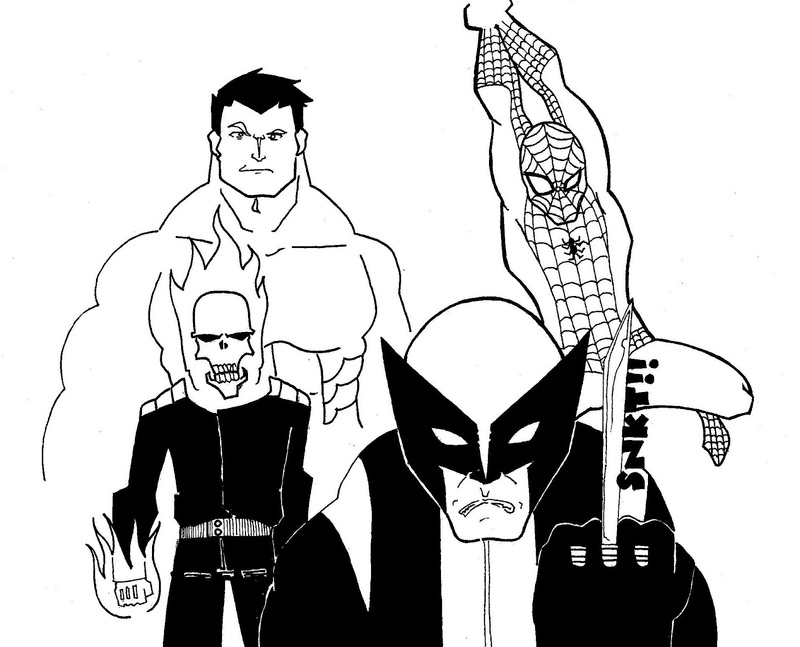 This time I'll be posting Hulk, Wolverine, Ghost Rider 2 and Spider-Man in all of their glory... Scrap that, Wolverine and Spider-Man stole this piece and stood out. At least for me. I'm bit disappointed with how GR and Hulk came out, they're a bit lacking (pls. don't pound me!?). If I suddenly find myself with all the time in the world, I'll be redrawing Hulk and Ghost Rider 2. Promise. A female Skrull alien name De'Lila who was an empath, a shape-shifter, and a telepath managed to capture the true Fantastic Four. Pretending to be Susan Richards she convinced Wolverine,Spider-Man, Hulk, and Ghost Rider to form a New Fantastic Four to avenge their "deaths". She sent them to fight the Mole Man so that she could steal a powerful Skrull device that crash landed on Monster Isle. The team briefly regrouped with Sleepwalker instead of Wolverine to fight the reformed Sinister Six. The original members reunited again as the first Secret Defenders at Dr. Strange's request to bring the Human Torch in for arson.